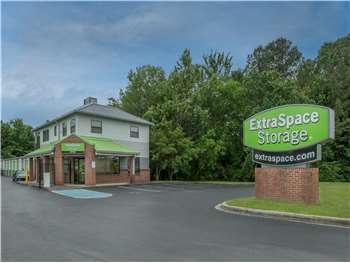 Located on Palisades Blvd off Oxmoor Rd a few minutes east of I-65, Extra Space Storage serves Birmingham residents near Homewood, Glen Iris, Vestavia Hills, and more. Locals will recognize our facility next to Marathon Gas and Taco Bell across from Walmart Neighborhood Market and Virginia College in Birmingham. Are you a college student in Birmingham looking for convenient self storage near campus? Extra Space Storage is about 2.9 miles from Samford University, making us an accessible option for students who need summer storage or storage while studying abroad. With a large selection of storage units, climate-controlled storage, vehicle storage, and more, Extra Space Storage on Palisades Blvd is the storage partner for you in Homewood, Birmingham! Our Birmingham storage facility offers unit sizes from 5x5 to 20x30, so we can handle both residential and commercial storage needs! We also have units with features like first-floor access, indoor access, and drive-up access for your convenience. Store your items with peace of mind at Extra Space Storage! With security measures like an on-site resident manager, 24-hour video surveillance, and electronic gate access, you can rest assured your belongings are safe with us. Protect your temperature-sensitive items from Birmingham's extreme heat and humidity with a climate-controlled storage unit. These units stay between 55 and 80° year-round, preventing damage to your belongings. Climate-controlled units are available in sizes 5x5 to 10x20. Our Palisades Blvd location offers secure vehicle storage in Birmingham! With 8x20 outdoor parking spaces and 10x10 to 20x30 enclosed drive-up units, we can handle cars, motorcycles, boats, and RVs. Not only does Extra Space Storage provide high-quality self storage, but our team is dedicated to providing an excellent experience. Our friendly, professional staff maintains a clean, secure facility at all times and is happy to answer questions or help you find a storage solution. Contact us today to reserve a storage unit in Birmingham! Website was great to reserve a unit & office staff was very patient and attentive to my needs / wants. Several locations near my location. Seems to be a secure facility. Friendly, competent employee. They have specials, which are a pretty good deal. Wonderful experience the employees were patient, knowledgeable and helpful. I would recommend them to anyone. The property is secure and clean. I've rented there before and I will continue to rent. Extra Space Storage set us up quickly and efficiently for our needs, no hard selling to get us to use a larger unit but made sure the sample shown met our needs. Reasonable pricing for the space and safety/location being provided. Thanks Extra Space Storage of Homewood/Palisades! I have dealt with other storage facilities in the post and Extra Space Storage is by far the cleanest, reasonably priced with the most friendly and awesome staff. Thank You!! ???? Very convenient location with friendly, helpful staff. The customer service here was awesome from first impression until the time I walked away with my contract. Clean units and competitive prices. Good enough location. Nice staff. High security. Clean grounds. The people at Extra Space are helpful and nice. The location I chose is very convenient and easy to get into and out of. Always someone in the office on their designated hours. I love renting here because it is so convenient for a college student. Any time issues arise, the staff are quick to respond. They are friendly and keep their facility clean and well lit. I am pleased to give them my business. Will recommend to others just have a little difficulty with the gate at times. Drive south on I-65 S. Take exit 256B to merge onto Oxmoore Rd. toward Homewood. Oxmoor Rd becomes Palisades Blvd. Our facility will be on your right immediately before the intersection of Palisades Blvd and Palisades Dr.
Drive north on I-65 N. Take exit 256A for Oxmoor Rd toward Homewood. Keep right to merge onto Oxmoore Rd. Oxmoor Rd becomes Palisades Blvd. Our facility will be on your right immediately before the intersection of Palisades Blvd and Palisades Dr.
Drive west on Lakeshore Dr to Columbiana Rd. Take a right to drive north on Columbiana Rd to Palisades Blvd. Take a right to drive east on Palisades Blvd. Our facility will be on your right immediately before the intersection of Palisades Blvd and Palisades Dr.
Drive east on W Valley Ave. Pass I-65, and turn right onto Green Springs Hwy Ste. Turn left onto Columbiana Rd. Turn left onto Palisades Blvd. Our facility will be on your right immediately before the intersection of Palisades Blvd and Palisades Dr.